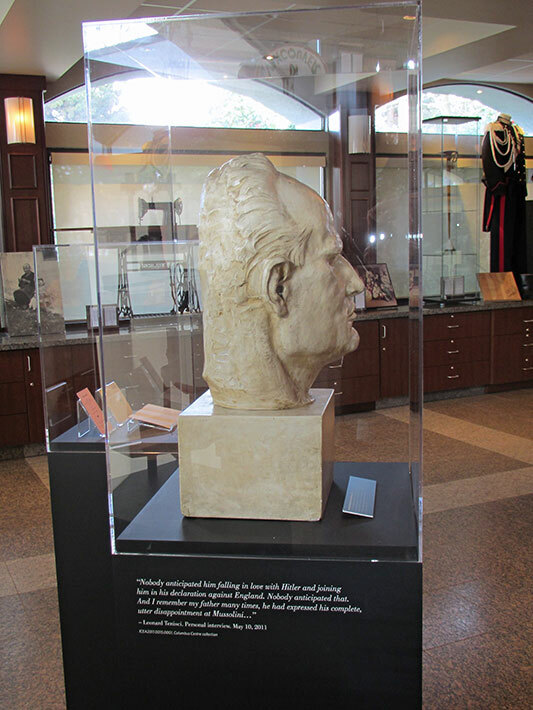 The case contains the Bust of Benito Mussolini by Charles Marega (ca. 1930) on loan from the Museum of Vancouver. This bust was found in the basement of the former Italian consulate after World War II. It was anonymously donated to the Vancouver archive following a mysterious telephone call to the City Archivist, Major Matthews. The bust is the work of renowned sculptor, Charles Marega, (1871-1939), the sculptor of many of Vancouver’s landmarks, such as the lions of Lions Gate Bridge. For more information about the bust see LDICEA2012.0035.0001.